Why film cameras are making a comeback? Film cameras at the moment covers only a niche corner in photography market. However, in recent years, their popularity has gone up for the first time after the mass consumption of digital photography. Not being able to view the photo immediately after shooting. So no corrective action is possible while being on the spot. Film speed (ISO) is fixed for the whole of shooting. In digital cameras, it is possible to change ISO for every photo depending on lighting condition. Limited photos that can be shot from each roll of film. Due to limited photos available in each film, you will be forced to think about composition as not to waste film. This can, subjective though, can turn into a better photographer. 35-mm film cameras are cheaper than full frame digital cameras. 35-mm film cameras are often smaller than full frame (or even APS-C) digital cameras. This is because image processing happens outside film camera (during negative development) whereas in a digital camera, manufacturers need to put an image processing mechanism inside the camera. This makes digital cameras larger than film cameras. Flim photos last longer. Printed album is less susceptible to file corruption than digital forms. People are more likely to browse their printed photos compared to digital photos. Some people find hands-on film development more rewarding as hobby. Film cameras have nostalgic values to some people and they feel proud of that. Some shooters also feel film cameras can differentiate them from the digital camera mass crowd. Mechanical film cameras can operate without batteries. Longevity – digital cameras have typical life of 10 years whereas mechanical film camera can lasts over 50 years. How to run Windows apps in Mac/Linux (and vice versa)? If you are running Linux and want to run Windows application, then you have following choices. Install Windows via virtualization software. Then install your Windows application on top of it. No need for dual booting. You can switch from Linux apps to Windows. You can share files between Linux and Windows (some configuration required). You need a valid copy of Windows. Virtualization is resource intensive. Unless you have high amount of RAM (16 GB or more) and fast hard disk (e.g. SSD) performance will be poor. Install Windows via dual boot partition. You can either work in Linux or in Windows. Need to have a valid copy of Windows. You are effectively running a Windows PC under this route. Run Windows application natively on Linux. No copy of Windows needed. This can be achieved by some Windows emulator software in Linux like WINE, Crossover etc. These software install a Window-like layer on top of Linux as a sandbox. You just need a valid copy of Windows application – which you will install via emulator in Linux. You can easily switch between Windows application and Linux in same session. This option could be buggy. Not all Windows application can be run in this way. Some manual trial and error with configuration settings is expected. Buy your OS specific version of the application. Guaranteed to work. For example, Microsoft sells Office software for Mac OS too. You are paying for the software again for different operating system. Some format compatibility issue may still come up if both software versions were not compiled using same code base. So which option do you choose for your favorite application? It argues that you can control 2 parameters which would influence the 3rd parameter. In ideal scenario, growth should be high, unemployment should be low and inflation should be low too. Keynesianism states that Central Bank should do the opposite of what public is doing. Thus, in case 1 above, government should save money and try to control inflation (because if more money is flowing to economy, the inflation would rise). Keynesianism always gives priority to low unemployment over low inflation. Thus, it makes poor less poor and rich less rich (a reason why riches often dislike Keynesian economy). New musicians, especially who studied Indian swaralipi first and trying to study Western staff notation (and vice versa), often get very confused about how to align Indian swaralipi with western staff notation. The key thing to understand here that in Western Music notation, each symbol represents an absolute note. For example, in a staff notation you always see whether it is C4 or C5. However, in Indian swaralipi (= sa re ga ma pa dha ni) is made of relative notes! The Sa can be C, D, E, F, G, A, B anything! In fact it can be C# or Ab too. When you play a western staff music notation, you are expected to play exactly as it is written. That means, staff notation shows whether you will have to play C4 or G#3 etc. However, when you play a Indian swaralipi, since only relative notes are shown, it is up to the player to choose which scale s/he wants to play in! Now it is the player’s discretion whether s/he wants to start Sa in C or D or E or whatever. Suppose, you have staff notation for this tune in C major. If you follow that notation, you have to play in C major. However, one can still play it in other scale like D major, F major etc. – by transposing it to a target scale (software like MuseScore can do it by flick of a menu). In a way, the Indian notation is easier since it is entirely relative and you are free to play at any scale of your choice. Western staff notation is more rigid in this aspect (though you can re-write it by transposing – as mentioned earlier). However, staff notation is very rich and can convey timings, rhythm, chords etc. in much more details compared to swaralipi. Any Indian tune or swaralipi can be always converted (manually) to staff notation. The reverse is also true, though you are likely to loose some complex information as there is no swaralipi equivalent of some concepts of staff notation. There is a dearth of good quality written Indian tunes (compared to western music whether you can get notation of almost any popular tune). This is because Indian musicians predominantly play by ear where as western counterparts play by ear and/or sight as well. If you are an Indian musician but unable to read staff notation, I strongly recommend that you learn it. It is not only versatile (in spite of steep initial learning curve) but universal too. People from anywhere can exchange music using this format. Free software like MuseScore, make it very easy to compose music using staff notation. What constitues of Social Status? Social status is usually determined by many factors some of which are explicit e.g. perception about wealth, power while some others are implicit e.g. social mobility/background, education etc. If everyone knew each other’s income/wealth, then it would have been very easy to determine everyone’s status because monetary wealth is still probably the most significant factor determining the social status. However, as people often don’t know other people’s income, they often try to judge the number indirectly via other cues demonstrated by concerned persons. So what are the attributes that shape someone’s social status? This is one of the most important aspect of determination of status. More properties (or land) you own, more status you command (this can be somewhat diluted if property is your primary source of income). People try to guess (in some countries like UK property purchase price is in public domain) the price of property(s) you own and place you accordingly in social ladder. Some occupations automatically place people in the higher up because of the known average income level people earn in those professions. Thus, doctors, lawyers, accountants, property developers, managers, Management Consultants, CxOs etc. Blue collar jobs are often associated with low social status. Fore retired people, it the last occupation/role/grade they retired from. This can manifest in several forms. It can be political power or be closely associated with someone in family/relative with such power. Can also be influencing power or popularity like well known actor, singer, social worker, author etc. This is also somewhat linked with Social Mobility. If someone starts life as poor but then becomes rich is usually considered of less status than someone coming from a rich family and maintain that heritage (even though the former should be given more credit). Power can also be popularity of someone within known friend circle. However, someone can be “likeable” but not necessarily considered “loaded / wealthy”. In Western countries, only the rich people can afford domestic help. If you are able to keep cook, nanny, cleaner on a regular basis in your house, that shows you are wealthy. In India, having couple of domestic maids do not signify any status however, if you have several servants, then it does indicate status symbol. Appropriate clothing can uplift one’s social ranking (even for a short time). Your apperarence and what you wear is what other people always see. A well groomed appearance with calm, composed mannerism indicates higher ranking (provided not everyone in the room are of same type – if so, then people try to downshift others’ if their appearance is below par). It should be noted that in some events (e.g. marriage ceremony) everyone is well dressed. During that event, it is difficult to judge anyone’s status. However, it is the repeated apperance in which indirectly create a perception of one’s status in known circle. The way someone communicates and convinces opinions as facts can also influence others’ perception and thus can uplift. E.g. speaking slowly in UK uplift one’s status (while it downshifts in India as people assume speaking slowly means one is not having grasp of the subject). Public figures (e.g. ministers, flim stars etc.) are very careful never to show their unkempt appearance in public. These are often manifests by ownership of branded goods. Wearing jewelleries, branded clothes etc. indicate that someone is able to spend lavishly. However, this is somewhat weak indicator of status as in Western society, one can be cash poor yet buy expensive cars, phones, gadgets under “hire purchase” scheme. I understand this article can be subjective and not everyone will argue with everything mentioned. Why oil price is falling? First of all, oil price did not fall suddenly. It is falling since last few months. Only recently it has become big news because compared against last few months, it has now fallen too much. So how much it fell? Compared to last year this time, crude oil price fell by ~50%. Current oil price is ~ $50 per barrel. So what caused this fall in price? Any price fall can be explained using simple economic theory of supply and demand. However, the tricky question is what caused imbalance to supply demand theory. In past few months, supply has gone up but demand has fallen. Development of more fuel efficient machines, cars etc. Why supply has gone up? USA is producing more oil especially via shale gas. This has caused reduced demand (from other countries exporting oil) from USA. Fracking i.e. release of natural gas below surface has led to less demand on traditional oil. Libya and Iraq continuing to produce oil in spite of experts expecting fall in production from there. OPEC, which often controls oil price indirectly, has refrained from restricting production and let it follow a natural path. Now this is somewhat mystery why OPEC is not intervening. Some analysts say that Saudi Arabia (http://en.wikipedia.org/wiki/List_of_countries_by_oil_production ) has decided to carry on normal production as it thinks restricting supply, although may bump price up, will help Iran and Russia whom Saudis don’t have good relationship. What is the effect of oil price fall? It is difficult to predict, but in general it is believed that fall in price is good for overall world economy as it will lead to cheaper goods and thus can lead to more economic activities by consumers. Russia has been affected negatively because it is generating less income via export but still need foreign currency for import. Some companies associated with oil industry have been affected by fall in profit obviously. What are different types of watches? 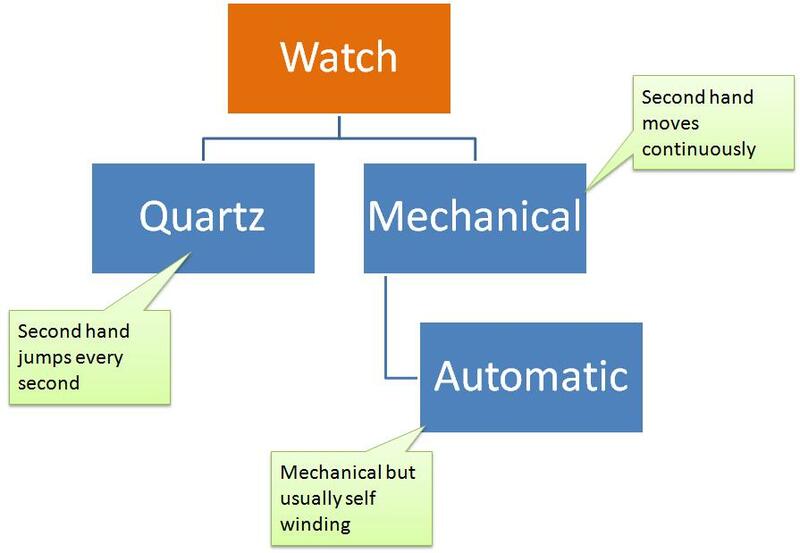 Watches are broadly of 2 types – mechanical or quartz. The easiest way to identify a quartz or mechanical watch is to look at the movement of second hand. Quartz watch will have second hand which jumps every second where as in a mechanical watch, the second hand moves continuously. Mechanical watches don’t have batteries so they need regular winding to make them work. Obviously, in modern world such action is bit awkward. So there is a different watch type, called automatic. They are also mechanical watches but they are powered by normal hand movement as part of your standard day to day life. AccuracyExtremely accurateCan gain/lose few seconds every day. Identification Second hand jumps or digital display. Second hand moves continuously and analog display. Popularity 85-90% of all watches in the world are quartz. Only 10-15% of world’s watches are mechanical. Power source Battery (some are rechargeable via light) Stores energy in springs via manual winding or normal hand movement (automatic). Maintenance Don’t require any maintenance (other than battery replacement if necessary) Besides winding, these watches require servicing in every few years. FeaturesAlso called “complications” in watch industry terms Can offer lots of features like multiple times, alarm, stopwatch etc. They can offer similar features too but such watches tend to be too expensive. Manufacturing Automated via tools Some manual craftsmanship is often required. Longevity Can last 10-20 years. With proper servicing, can last 50-100 years. Accuracy Very accurate Can gain/lose few seconds every day. The world of watches is very fascinating. Read about it on the internet in your spare time. What are common analog world time watches? Should be able to show at least dual times at once. Seeing time for any time zone should not be overly complex. There should be a mechanism to swap primary and secondary time quickly. Solar powered is preferred so that you don’t have to change battery. We shall see in this post how difficult it is to achieve all those parameters within budget. Please bear in mind that there are probably over hundred models of such analog world time watches. Some of them are very expensive. Not all of them offer half hour GMT offset. A quick way to figure that out is to look at dials and see if Delhi is featured. It should feature between Karachi and Dhaka. If Delhi is missing, that means the watch cannot show half hour GMT offsets! This means, in those watches, the minute hand for second time will be always synchronized with primary time. Even some very expensive watches have these problem! 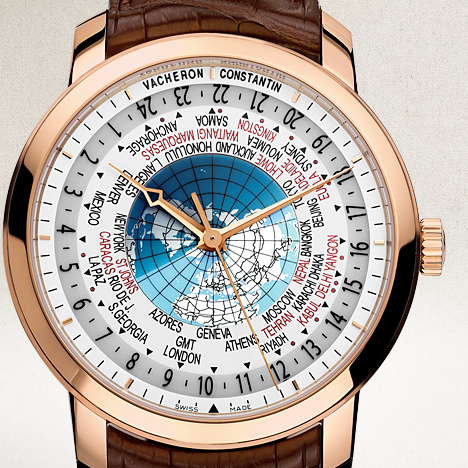 Some watches can only show GMT/UTC as a second time. You can’t set second time zone as any city in the world. Ok, enough talking, now let’s see some watches. Note: Prices shown are RRP on July 2014. Specific models may be retired anytime although other models in same series usually available in market for a long time. If you can find deals, often you can buy them at cheaper prices. The list is not in any particular order. 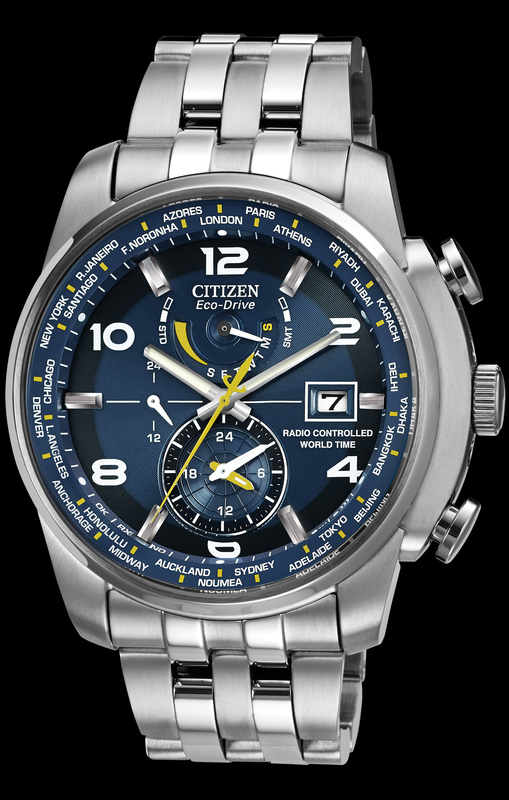 Citizen eco-drive World Time AT 9010-52L [£379] This is a typical world time watches. It does feature Delhi so covers all time zones. The smaller dial shows secondary time in 24-hr format (this is common for many of such watches). The main dial shows time in 12-hr format but a separate dial (at upper left) indicates whether it is AM/PM via a 24-hr needle. The watch allows you to check time at any shown city by pressing couple of buttons. It also allows to swap primary and secondary cities by pressing 2 buttons at once. 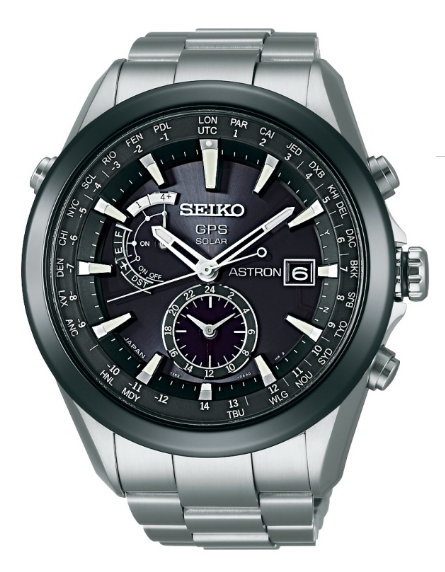 Seiko Astron SAST003 [£1995] This watch picks up GPS signal (as long as it can see sky) and automatically adjusts the time! This one is solar powered too. Mind that, there is a difference between radio controlled time and GPS controlled. Radio signals are emitted from only few places (typically USA, Germany, Japan etc.) and from the world and watch needs to be within 1500 km of that zone. However, a GPS signal can be picked from anywhere in the world – as long as access to sky is available. All satellites have atomic clocks in them – the signal that is picked up by this watch. So, in theory, this watch never needs time adjustment. This one is also solar powered. Yes, you read the price right! More of a glamor statement than utility watch. The clever design here is at middle ring, which rotates counter clockwise. 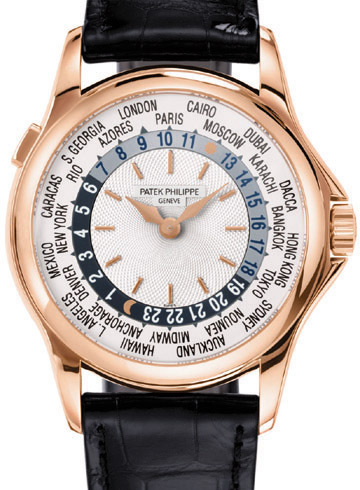 In the above image, the home time is Paris (indicated by Paris being at 12 o’clock position. The time at home is 10:09. As per dial, it is 12:09 at Moscow and 00:09 at Anchorage. Note that, this watch can’t show half hour offset zones – in spite of hefty price tag! Another glamorous watch! On a quick glance, it does not feel like it can show world time. In fact, it is just a dual time watch. You can see the main home time screen. The outer bezel rotates manually. 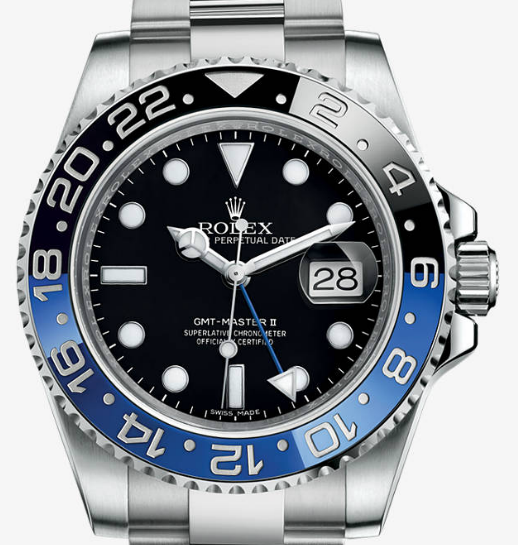 The blue hand with triangular pointer is GMT hand. You can set this hand to show any other city’s time. But here as well, as you only have an hour hand for dual time, the minutes hand is same for both home and secondary time zone – which in turn means this watch too can’t show half hour GMT offsets. I think now it is fair to say that spending more does not automatically mean having more functionality! 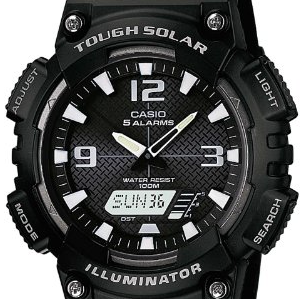 Casio SPF60 [£75] This is also not a true world time watch but a dual time watch. The analog and digital times can be set independently. However, alarm/calendar works only on the basis of digital time. The watch also provides reading for barometer (with last few hours trend), altimeter and a thermometer. This watch can show 3 times at once. The main one, GMT/UTC in upper middle and another one for selected city (showing TYO in above image). The home time can be set against any of world’s main cities. In above image, it was set for NYC. However, the GMT/UTC will always show UTC (in 24-hr mode) and you can’t set it to show any other time. 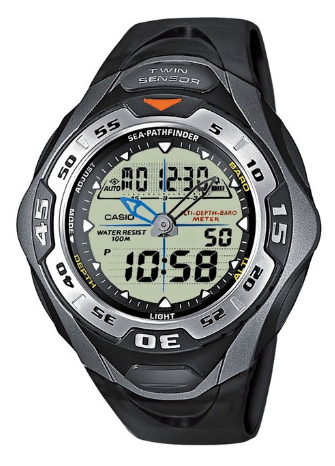 Casio AQ-S810W-1AVEF [£55] Even though you can’t immediately recognize it, this is actually a world time watch! There is only one analog dial though. The second time is displayed digitally (not shown in above image). The digital time can be set for any of world’s main cities. However, you can easily toggle between home (analog) and secondary (digital) time zones. For example, if you set your analog hands for LON and digital for DEL and then you went to Delhi, then you can easily toggle analog hands to show Delhi time and digital one showing London time. This is a solar watch and also available with steel band. 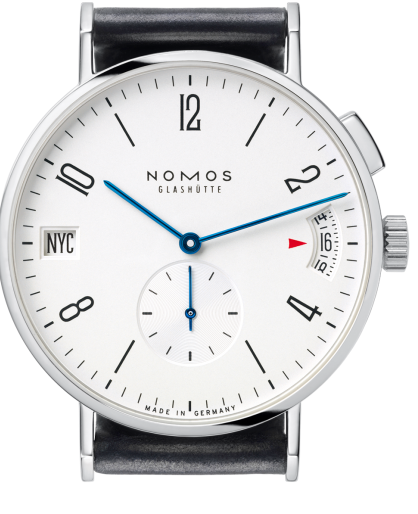 Nomos Glasute Tangomat GMT [£3100] Another watch which, in spite of high price tag, can’t show true world times. The smaller window shows home/second city but because there is no secondary minute hand, it can’t show half hour GMT offset times. The main dial shows time for selected city (at 9’o clock position). 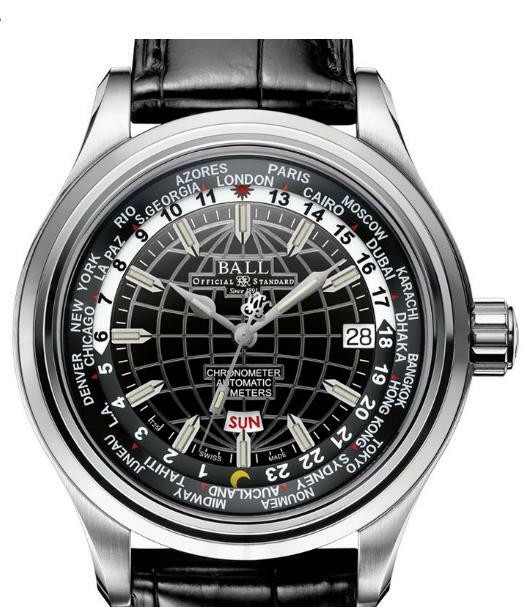 Ball World time GM2020D-LCJ-BK [£2400] Another watch where Delhi is missing! Vacheron Constantin Patrimony World Time [£26000] This is another status symbol! This has got 37 world time zones (including half hour offsets which are marked in red). You can rotate the city name dials. In the above image, the home town is set for Geneva (because it points to black triangle at traditional 6-o’clock position). You can now read time at any of world’s cities in 24-hr format. As you can see in the dial, this one can show half hour GMT offsets. This is an automatic watch with 8 days of power reserve. 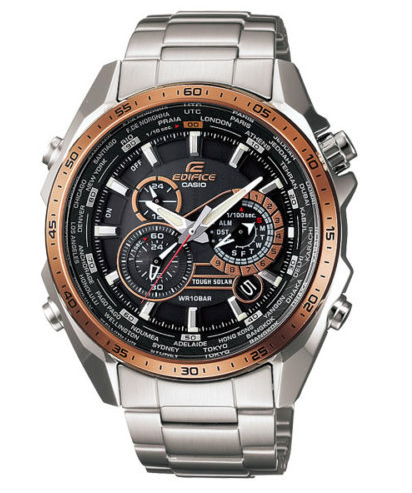 There are many other similar watches at varying price range. By now you must have got some good idea of what to look at world time watches. 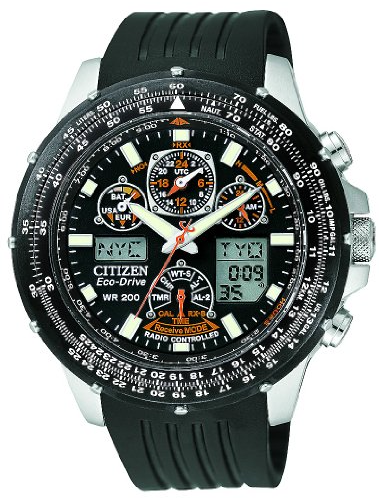 My advice: For functional and affordable watches, stick with Casio, Citizen or Seiko. For glamor statements, buy whatever your bank balance permits. What questions you like to be answered here? This blog was an inspiration after publishing of the book. Some topics from this blog may go in the next book in this series. Why do smart phones freeze (or hang or lock up)? Why squatting toilet is used in some parts of the world? Why most US locomotives have single cab while European ones have dual cabs? Why auto rickshaw is not used as personal transport?